Muse are offering fans a chance to hear a new song called United States Of Eurasia by way of a global treasure hunt involving four hidden USB sticks. 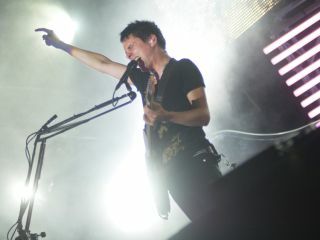 The sticks, each containing a code that must be entered on the microsite Unitedeurasia.muse.mu, allows users to access a puzzle which, when solved, can unlock part of the song. The USB sticks have been stashed in Berlin, Tokyo, Hong Kong, Moscow, Paris and Dubai. It is said that special 'agents' are standing guard in each locale. Fans in Paris and Berlin have found the first two sticks, which leaves two USBs unaccounted for. If it all sounds a little confusing and convoluted, that's probably the point, as Muse have been notoriously guarded about information regarding their much-anticipated album The Resistance. What is known at this point is that the band spent over a year on the project, and it includes a three-part 'symphony' called Exogenesis. At this point, Stages 1 and 2 are complete: Willy Tarno nabbed the first USB key in Paris and 50 people solved one puzzle. Bjorn Larski located the next key in Berlin and Matthew G figured out the second puzzle. Which means that two clips of The United States Of Eurasia are now available for streaming here. Clues as to the whereabouts and pickup times for the remaining USBs are on the microsite, so c'mon, folks, get on the, er, stick(s). Let's hear this bad boy already!